Whether you run a small business on a shoestring or are fortunate enough to have an entire team of accountants on staff, your accounting cycle could probably benefit from a little fine-tuning. Read on to learn about the accounting cycle steps, and discover how Lucidchart can help streamline your accounting cycle and get you to the bottom line faster without missing out on a single detail. The accounting cycle consists of several steps, all of which include several secondary steps and pieces—so the process can get messy, quickly. While a trained accountant can easily go through the cycle, Lucidchart will let you create detailed overviews of each step. From training new employees to keeping financial processes easy for other teams to understand, Lucidchart will help everyone stay informed. 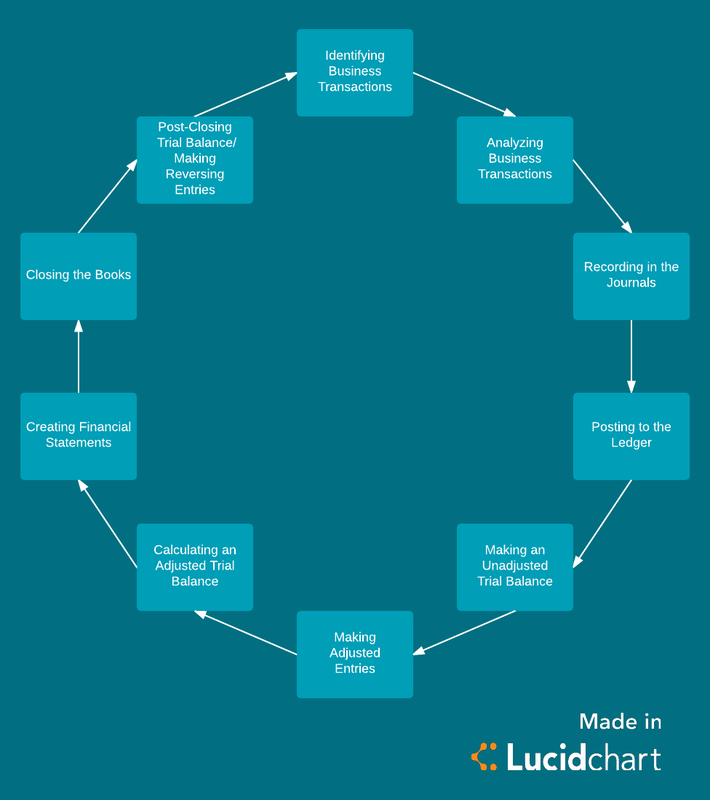 So what are the steps in the accounting cycle? 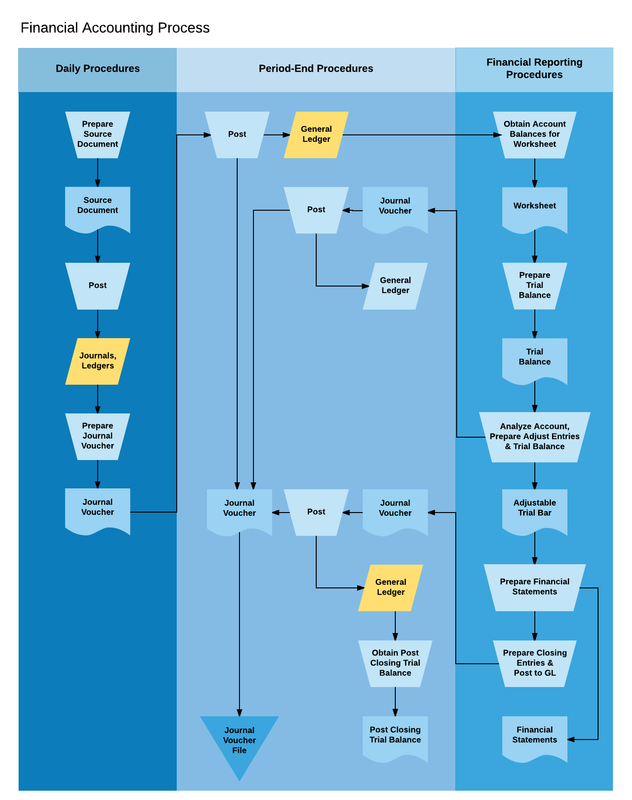 Continue to read about each of the accounting cycle steps, and then use Lucidchart to check off each of these important steps as you move through the cycle. Accounting doesn’t rely on cross-functional communication as much as other teams, but this first step depends on interdepartmental collaboration. Accountants need to access every internal and external transaction that involves the business’s assets being exchanged, including deposits and debt payments. Create a visual workflow in Lucidchart to get teams into the habit of tracking expenses, and ensure records of transactions, or source documents, are easily accessible when the accounting department needs them. After gathering all business documents in one place, accountants record each transaction chronologically into books of original entry, or more commonly, journals. The term “journal” is somewhat antiquated, conjuring images of leather-bound tomes and fountain pens. For most accounting teams now, this step takes place digitally on accounting-specific software. Each journal features a debit and credit account, and accountants separate major categories of transactions, including sales, purchases, cash receipts, and cash disbursements, into individual journals for clarity. As you get new accounting team members up to speed on the process, a Lucidchart document detailing which expenses go into which journals will help with clarity and organization. 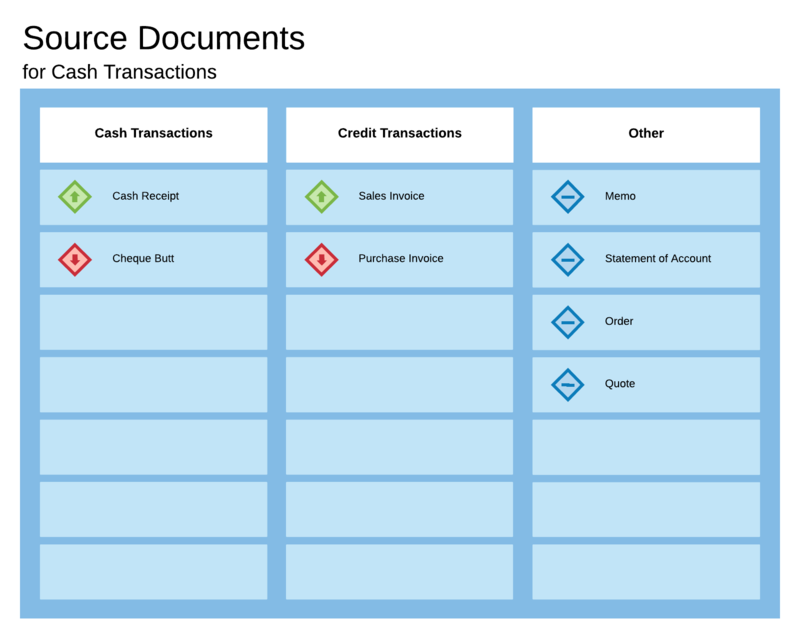 Once the accounting team corrals all transactions into the right journals, they calculate the changes that each transaction makes to the accounts in the ledger. A ledger usually exists as separate asset and liability columns on a balance sheet that keep track of changes that each transaction makes to each major account. Depending on how many accounts you have, the ledger could include many categories, including cash, accounts receivable (assets), and notes payable and accounts payable (liabilities). Once, this process was carried out completely by hand, leaving room for far more errors, but now recording and posting happen almost simultaneously. After updating the balances for each account, the accounting team tests to be sure each account’s debits and credits balance each other out. During this step, accountants aim to catch errors like double posts, forgotten expenses, and simple miscalculations to prevent more serious issues later on. Build a simple visual in Lucidchart to track common types of mistakes and leave comments to help your team stay aware of errors. One-off oversights are inevitable, but by housing a list of frequent mistakes in one place and communicating about them as a group, you’ll notice patterns before they become habit. If lapses are coming from outside the accounting department, share this information with other teams to improve collaboration and make your accounting team’s job easier. At this point, accountants have recorded all straightforward business transactions, but a few outliers may remain. The accounting team makes adjustments for any transactions that haven’t been recorded by the end of the month, such as deferrals and prepayments. These less straightforward transactions must be included each reporting period to maintain the accuracy of financial documents. If your team needs guidance tracking these extra transactions, create a Lucidchart diagram to clarify how to keep them organized and listed in a place where they won’t be forgotten. After making additional entries, accountants check the balance sheet again to be sure debits and credits remain balanced. As with step three, accounting software executes this step quickly and efficiently. You can create templates to prepare your team and help them keep track of all requirements. If your company has any unique parameters or extra supplemental materials that need to be generated at this point, take advantage of Lucidchart’s easy customization and include those requirements in your template to be sure your team is prepared to meet demands. At long last, after seven careful accounting cycle steps, closing the books puts to rest the entire accounting process—almost. Income and expense accounts are all condensed into an Income Summary account, and the books are “closed.” With a thump and a cloud of dust—or in reality, the click of a mouse—accountants hold the business’s temporary or nominal accounts in a balanced, updated state until the next accounting period begins. As the very last step in the accounting process, you need to create a post-closing trial balance. This step simply requires you to complete one final check of any permanent/real accounts, which weren’t closed in the last step, to be sure debits and credits remain balanced. After this, some accountants might begin making reversing entries, but this step technically happens at the beginning of the next accounting cycle. Reversing entries undo adjusting journal entries that no longer qualify as assets or liabilities. For a trained accountant, the steps in the accounting process are second nature, but your accounting team (and the rest of your company) could still benefit from added organization during the process with the help of Lucidchart. Customize a free Lucidchart template to fit the needs of your team, and you’ll streamline all the accounting cycle steps and facilitate better transparency across your entire organization.